The Beaujolais wine region is famous for its Gamay grapes and stunning scenery, and the best way to get around is by bike. Take this private full-day tour from Lyon and cycle around the vineyards; enjoy a tour and tasting at a family-run winery; and tuck into delicious traditional cuisine (own expense). Your day begins with a 9am pickup from your central Lyon hotel by private vehicle. 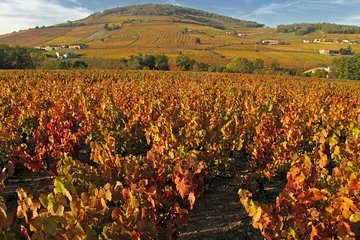 Accompanied by your private guide, soak up the scenery on the 1-hour drive, as you wind through the rolling vineyards of the Beaujolais wine region. On arrival, pick up your rental bike (rental at your own expense) and set out along the quiet country lanes. Enjoy an easy cycling route tailored to your preferences, with plenty of stops to admire views over the valleys and vineyards. After around two hours cycling, stop for lunch (own expense) at a local inn and sample an array of traditional French cuisine. After lunch, cycle to a family-run winery, where you’ll learn more about the winemaking process and have chance to sample a range of fine Beaujolais wines, before returning to the bike rental outlet. On return to Lyon, your tour ends with a drop-off at your hotel around 6pm.